While the basics of all exhauster bellows are the same, the exact dimensions vary from manufacturer to manufacturer. 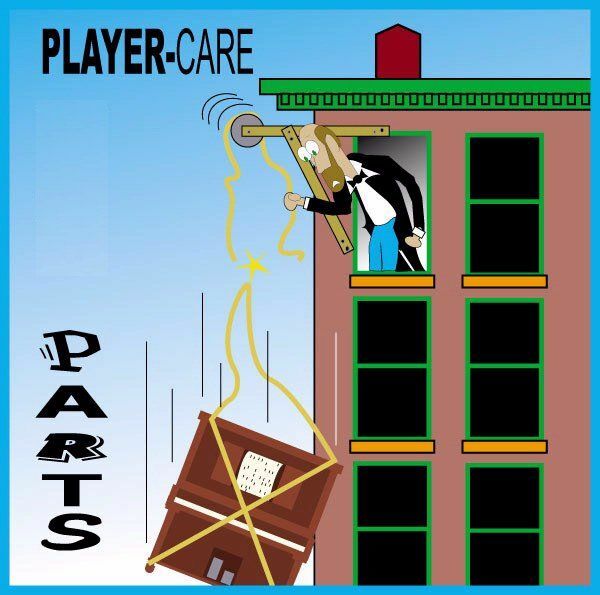 And, since there have been over 100 different player system manufacturers, no one has ever attempted to record the exact dimensions of the bellows or the stiffeners. Also, there are no 'formulas' for determining the 'proper' size and location of the stiffeners. The manufacturers experimented with their particular bellows until they found the combinations that worked best for the length, width, and span of their exhauster bellows. 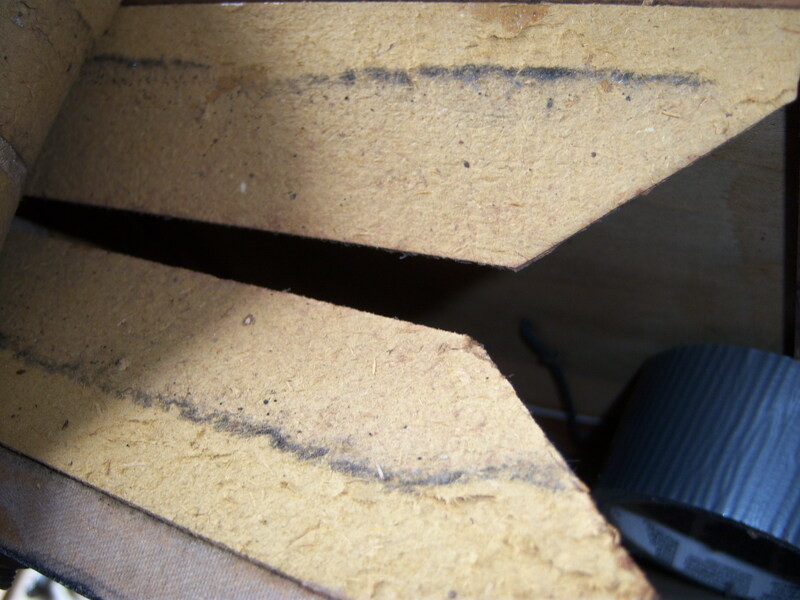 The best material for the stiffeners is the cardboard material that's found on the bottom of large deck-type calendars. It glues easily to the cloth. However, it's important to place weights on the stiffeners while the glue is drying to prevent them from curling. Cinder blocks work really well for this job. Others recommend ironing the stiffeners before the glue fully dries. If this is done, be sure to turn the covering over and iron on the cloth side, not the side with the stiffeners. In other words, don't put the iron directly on the stiffeners. The width of the strip of heavy bellows cloth is determined by the span of the bellow. Only rarely is the span of an exhauster bellow greater than 6" (six inches). The length of the strip is determined by the total perimeter of the bellow plus the overlapping pieces. There are two ways to do the overlapping portion of the bellow on the hinged end. These are shown in the diagrams below. Since the maximum width of heavy bellows cloth is 60" (sixty inches), if you encounter a bellow with a total perimeter (including the overlap) that's greater than 60", you'll have to use the technique that illustrated on the left. Otherwise the technique on the right is completely acceptable, even if the original bellow utilized the 2-piece technique. Typically, when these bellows are dismantled, exact measurements are taken of all of the stiffeners and their positions on the cloth. That way the stiffeners can be re-manufactured and glued in the exact location that they were originally. Also, there are no 'formulas' for determining the 'proper' size and location of the stiffeners. The manufacturers experimented with their particular bellows until they found the combinations that worked best for the length, width, and span of their exhauster bellows. STEP 1: Mark the center of the strip. STEP 2: Mark the center of the bellow at the span end with a pencil. It's best to mark the edge of the wood. That way the mark will not be seen once the cloth is glued to the wood. STEP 4: Using the thickness of the bellow board as a guide, mark the inside edges. This is especially important if the thicknesses of the bellow boards is different as it will effect the placement of the span stiffeners. STEP 5: Using a straight edge, draw diagonals and then glue the span stiffeners in place. Be sure that the edges of the stiffeners are no less than 3/16" from the marks on the cloth. If they are, the cloth will not fold correctly and stretching will occur. This will dramatically shorten the life of the cloth at the folds. Also, since the stiffeners have a natural tendency to curl when drying if not weighted in place, it is strongly recommended that weights are used to hold the stiffeners flat to the cloth as they dry. Cinder blocks or bricks work well for this task. STEP 6: Using the bellow as a template, lay the bellow on the cloth and mark along the inside edges of the boards. Then, using a straight edge ruler, draw a line from the center of the 'X' to the point where the bellow boards meet (at the hinged end). Then extend that line such that you end up with a straight line running the full length of the cloth in the middle. (NOTE: You can draw the center line at the beginning of this entire process IF the width of the bellow boards is identical. This will make aligning the bellow diagonally easier.) Now remove the bellow from the cloth. STEP 7: This is a very critical step. When positioning the side stiffeners, you must maintain the same spacing as you did with the span stiffeners (3/16" from the lines). Hopefully you have the original piece so you can measure the distance from the center of the span stiffeners to the forward edge of the side stiffeners. STEP 8: When gluing the wood to the cloth, it's really important that you get the span (or the bottom part) in exactly the right place. I normally lay the bellow down longways on its side and then 'roll' it up to the span side to verify that everything is going to be 'square' before I apply the glue. This is good to do in case the two bellow boards aren't exactly parallel with each other or if one or both of the boards is slightly warped. STEP 9: After the span side is glued, I apply the glue to the wood on the side and then lay the bellow down onto the cloth. (This is just the opposite of what Craig does in his video.) By doing it in this manner, you can see down inside of the bellow and make sure that the stiffeners are centered. Then, as soon as you've placed the bellow on the cloth after the first gluing, lift it back off to check the glue pattern. Once you're sure the glue is evenly spread on the cloth and wood, apply the last thin coating of glue and press the wood hard onto the cloth. Naturally, double-gluing, tacking, and ironing are absolutely necessary. NOTE: Also, unlike Craig, I always allow the glue to dry when doing each portion of the job before moving on to the next section. That way there's no chance of the cloth pulling away from a section that was just finished while doing the next section. Author's Note: After searching through thousands of pictures of previous jobs and reviewing the information in reference books, I concluded that the shape of the side stiffeners on the right side is the correct shape. Below are pictures from three other bellows that confirm my conclusion. According to Art Reblitz, this shape "prevents the cloth from buckling in and out during playing". 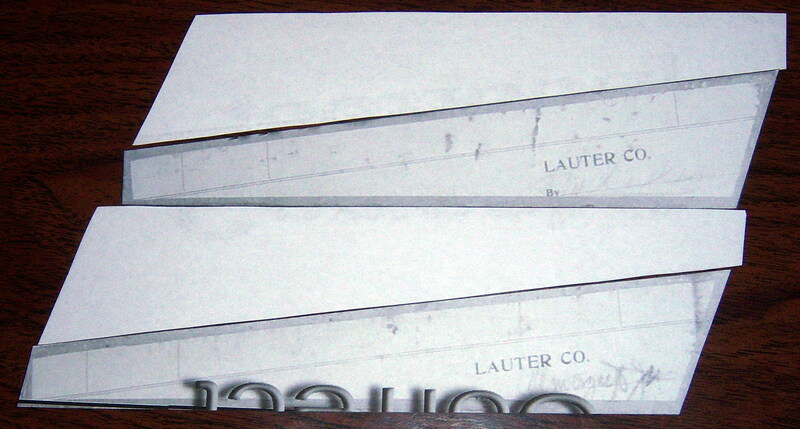 In an effort to gain a better understanding of how the error was made at Lauter, I printed full-size images of the stiffeners and then cut them out. Then I proceeded to attempt to lay them out in some pattern that made sense in terms of manufacturing the pieces. In the pictures below, I think I pretty much figured out the basic pattern that was used. And, while it is clear that each set of two mating pieces are mirror images of each other, it's also clear that Lauter didn't have an exacting 'template' for making the pieces. I make that statement because the two sets are by no means 'identical'. The lengths and the angles of each 'set' are slightly different, which indicates that they were cut by hand on a cutting machine. Regarding their placement on the cloth, I'm convinced that the stiffeners on the left side of the cloth were simply glued on opposite of where they should have been glued. So, it was simply a matter of human error. Author's Note: One other thing I will say... Having studied the function of stiffeners, it became clear some years ago that their primary function is to prevent the cloth from 'popping'. However, I believe now that their close second function is to stiffen the cloth. I know that must sound a bit counter-intuitive. Also see: Stiffeners. Next, consider what happens when the exhauster is on the return stroke. The pedal return spring is forcing the atmosphere (that was vacated from the system) out of the bellow. But also consider that this creates an imbalance in the pressures. As the bellow is closing, the atmospheric pressure 'inside' the bellow is greater than the atmospheric pressure outside. So, the bellow is going to have a natural tendency to 'balloon' outwards. 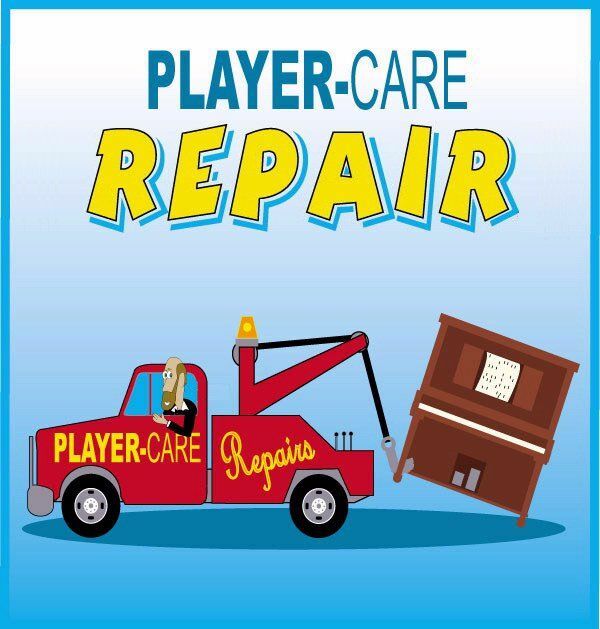 I believe this is what Art is referring to in his comment under the photo on Pg 74 of his book, 'Player Piano Servicing & Rebuilding'. Now, taking that into consideration, let's get back to the 'pressure' stroke. Just as the bellows cloth would have a tendency to balloon outwards on the return stroke, it has the same tendency on the pressure stroke. However, the bellow won't actually start 'working' until the vacuum level inside the exhauster is greater than the vacuum level inside the reservoir. As a side note, this fact became a real problem with players with stacks that are very air-tight. It became such a problem that the tension of the pedal return spring was increased so that the point at which the exhauster actually started 'working' became less noticeable. But I digress... Getting back to the ballooning effect, you begin to see that the function of the stiffeners on the pressure stroke is primarily to prevent the cloth from 'popping' (or being stretched suddenly -as I demonstrated in one of my YouTube videos). However, there is a secondary benefit -although probably relatively small by comparison. If the bellows cloth is relatively stiff (or it's shape under load is determined by the stiffeners), it won't balloon hardly at all. 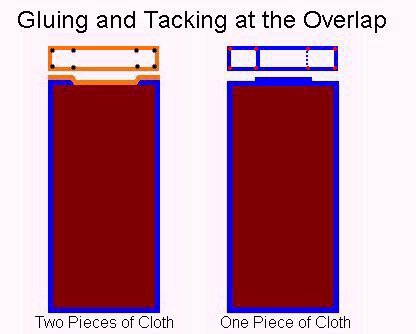 And when you think about the shape of ballooning cloth verses the shape of stiff cloth, what you see is that the stiff cloth is more efficient in terms of the cubic inches of air that the bellow can 'pull' out of the reservoir. That's because the cloth isn't stretching -or it's stretching very little by comparison to cloth without stiffeners. The inside and outside surfaces should be treated with sanding sealer first. Then the outside should be fine sanded with 150 grit and then sealed again, then fine sanded again. Then, most people paint the outside black with spray paint for appearance sake -but it's not 'required'... I use Krylon... Be sure to tape the edges so nothing gets on them during the sealing and painting process. Then seal the edges with hot hide glue until the glue stops soaking into the wood. Then sand the edges smooth with 150 grit. If the hinge is mounted on the inside or the bellow, as opposed to the top edge, it's best to put tape over the area where the hinge will go when you're sealing the inside. The hide glue sticks better to the wood than it does the sealer. Here again, pre-glue the area where the hinge will go so you get excellent adhesion when gluing the hinge in place. If there are any holes in the board (like for where the flaps go), be sure to seal the inside of the holes with hide glue and then sand the area smooth with 150 grit. It's also generally a good idea to dust the area where the flap goes with powered graphite. This prevents any possible sticking of the flap leather to the wood surface. In a case where the old boards are screwed to the main wind trunk from INSIDE the bellow, it's my recommendation that holes be drilled through the outside board so that the screws can be accessed AFTER the bellow has been recovered. Once the bellow is secured to the trunk, small 1" circles of heavy bellows cloth should be glued in place to cover the access holes.